The mission of The Joy of Sox is to give joy to the homeless by giving them new socks. On Thursday March 3rd Tom Costello, Jr, founder and Chief Sock Person, made another deliver of new socks to Our Brother’s Place (OBP), a homeless shelter in Philadelphia. Lou Baldwin (writer) and Sarah Webb (photographer) from CatholicPhilly.com were there to write a story about Tom and new socks for the homeless. Also on Thursday evenings volunteer medical students from Jefferson Medical College’s JeffHOPE program are at OBP to hold a clinic. The collaboration between JeffHOPE and The Joy of Sox is in it’s 4th year and really benefits the homeless. Since new socks and regular medical care are something they need it makes sense to give the new socks to the JeffHOPE clinics and have the med students give them out as needed. 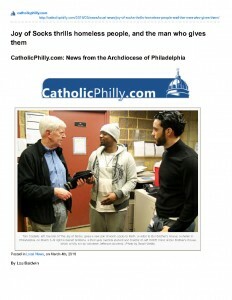 To read the full story on Catholic Philly click here. To find out more about JeffHOPE click here. To learn more about The Joy of Sox click here.